Gothic typeface, RANDOM CAPS, Then Some Italicized Words just for EMPHASIS -- before BAM! S O M E H U G E T E X T W I T H W E I R D S P A C I N G!! I've been trying to track down research on this typographic insanity, but unfortunately books on early 18th-century title-page design are not high-priority acquisitions for most libraries, and definitely not for MIT. The few works I've found -- Margaret Smith's The Title-page, It's Early Development and Margery Corbett and Ronald Lightbown's The Comely Frontispiece -- are not accessible, and may not even be of much help, since they look at periods before 1700. I'm also not as interested in specific arguments about the layout of title-pages, emblems, compositors marks, the use of long titles in the early modern period, why printers capitalized nouns, the development of certain standards, or how these pages protected printers and authors from piracy, although it's all incredibly fascinating, and I recommend both Ceri Sullivan's and Mark Bland's articles, linked above, for anyone interested in the visual rhetoric of early modern books. What I'm most curious about is how these title pages reflect certain beliefs about language from the seventeenth and early eighteenth century. Same typographic chaos as the title-pages -- gothic and italic faces, capitalization, punctuation marks peppered liberally over the page. It looks very strange to a twenty-first century reader, drawing attention to its medium, its use of the printed page, to the point that it's almost illegible (although it's good to remember that we have our own weirdnesses that seem "natural"). This same chaotic design crops up over and over again in grammar books, lexicons and universal language projects of the period -- much more than in other types of books. I'm wondering if there's a link here to changes in linguistic philosophy between the seventeenth and eighteenth centuries. Seventeenth century linguists and grammarians were obsessed with letters -- how they represent sound, how they look on the page, how they combine to form words. 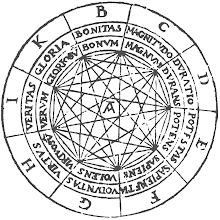 Most universal language projects of the period, like John Wilkins's famous philosophical language, use the alphabet to replicate the natural order of the universe, seeing letters as the building blocks of thought in much the same way corpuscles were seen as the building blocks of matter. By changing typefaces, then, one could inscribe all the nuances of speech -- sarcasm, prosody, gesture -- onto the very look of the letter, thereby naturalizing print as a gestalt communication technology encompassing orthography, orthoepy, and the natural order of the universe. Here, typography is not just used for stylistic emphasis but becomes a kind of syntax reflecting linguistic beliefs. Perhaps as language begins to be seen less as an aggregation of letters and more as the product of logical thought and the rational operations of the mind, typography, too, reflects those changes. I don't know. It seems a difficult, but interesting, idea. WOW. I'm not the only one who's ever wondered about this crazy typing - they also used it on advertising posters. Sometimes even with a bit of red splashed in.